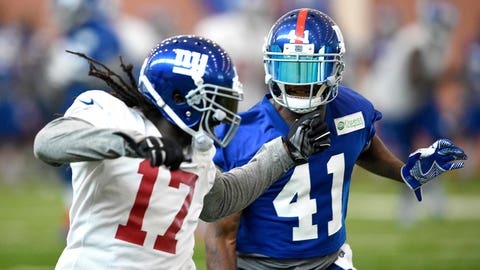 It will take a lot to take Giants corner Dominique Rodgers-Cromartie off the field as the team enters Week 6 short-handed in the secondary. The NFL is not taking any chances in 2015 — if a player suffers a big hit around the head area or shows any signs of a potential concussion, he must go through the proper protocol. New York Giants corner Dominique Rodgers-Cromartie was put through the concussion protocol back in Week 2, but this was a decision he disagreed with. The team's decision to put him through the protocol cost him the next game, because it was played on Thursday night, and there wasn't enough time for him to be cleared in advance. With starting corner Prince Amukamara out with a pectoral injury, Rodgers-Cromartie understands the importance of staying on the field in Monday's Week 6 game at Philadelphia.